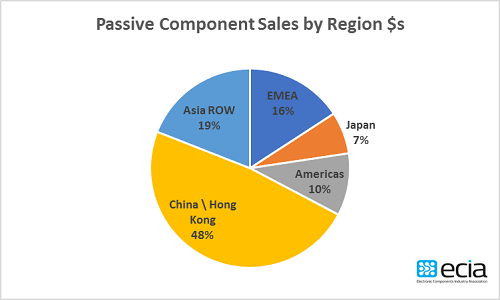 The Electronic Components Industry Association (ECIA) has reported that global sales of capacitors, inductors, resistors and other passive components increased by 25.2 percent in calendar 2018. Unit shipments of these devices grew by 16.7 percent to 7.4 trillion. Last year was marked by severe shortages in passive components, particularly certain types of capacitors. Demand is expected to remain high for these parts through the first half of 2019 and likely beyond as manufacturers ramp up capacity. Average selling prices for these devices increased by 7.3 percent. Capacitor sales were up 12.5 percent in units and 27.9 percent in dollars. Average selling prices improved 13.7 percent. Inductor sales were up 4.6 percent in units and 5.4 percent in dollars. Average selling prices improved 0.8 percent. Resistor sales were up 23.7 percent in units and 41.1 percent in dollars. Average selling prices improved 14.0 percent.